Eggplant dusted with flour and fried crisp in olive oil has always been one of my favorite appetizers. Served over mesclun greens and topped with a garlicky yogurt dressing it makes for a quick lunch or even a light dinner. I made this for lunch last Saturday after all the craziness with the interview and the photographer and it couldn't have been easier. Eugene also had the brilliant idea to add a dollop of hummus to the eggplant slices; a touch which I absolutely recommend. When preparing eggplant in any kind of quick-cooking method such as frying, it's best to salt the fruit (yes, fruit!) to eliminate the natural bitter juices and excess moisture, which gives it a stronger and more firm texture after cooking. To salt an eggplant, slice it as directed in your recipe and sprinkle liberally with kosher or course salt. Let the salted slices sit until the liquid starts to bubble to the surface (I also like to like with paper towels above and below or leave the slices in a colander over a bowl). This typically takes about 20-30 minutes. Rinse the slices well (to remove the excess salt and bitter juices), and then pat dry with paper towels. You can then proceed with the recipe as directed. For a longer explanation and tutorial on salting eggplants, read this post I wrote last year on the subject (it also features a recipe for a warm eggplant ricotta bake). It takes a little bit longer, but I think it results in a crisper and sweeter final dish. 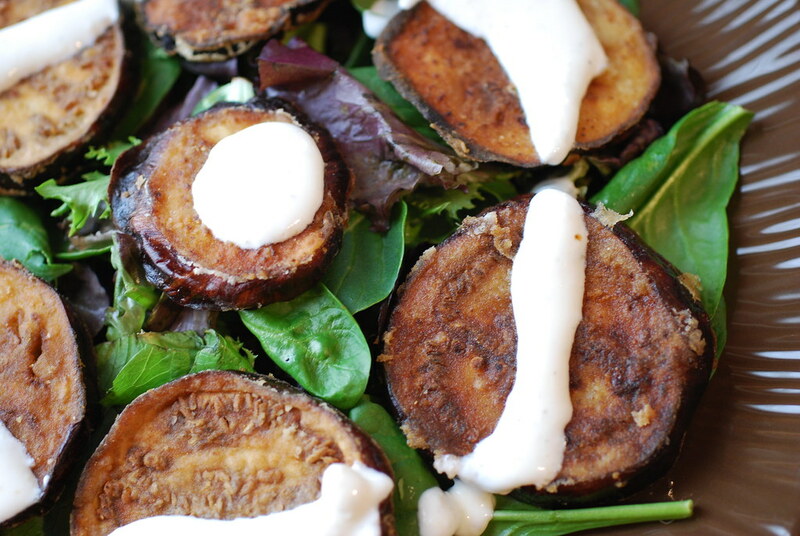 Pan-Fried Eggplant Salad with Garlic Yogurt DressingThis will serve two to three as a lunch or light dinner. It can also work as a salad or appetizer course before an entree for 4-6. 2. Gently goat each eggplant in the flour, using the eggplants natural moisture to adhere the flour. Set aside on a parchment paper lined cookie sheet. 4. Fry the eggplant slices in batches, making sure not to crowd the pan. Fry until golden on each side, then remove and let drain on a paper towel-lined tray. 5. In a food processor or blender, combine the Greek yogurt, 3 garlic cloves, salt, and lemon juice. Blitz until well blended and the garlic is completely processed. Pour the dressing into a serving dish. 6. To serve, arrange the salad greens on a large platter and top with the slices of fried eggplant. Drizzle a bit of the dressing on top, plus more on the side. i have a feeling i'd really like this. strangely though, i only just bought greek-style yogurt for the first time THIS week. crazy, i know. i used it in a recipe i haven't blogged about yet, but it was definitely good. Now I can't wait for lunch so that I can make this. It looks so delicious! awesome job posting every day ... keep it up! Oh my goodness.. this looks so amazing! So glad I stumbled by your blog!